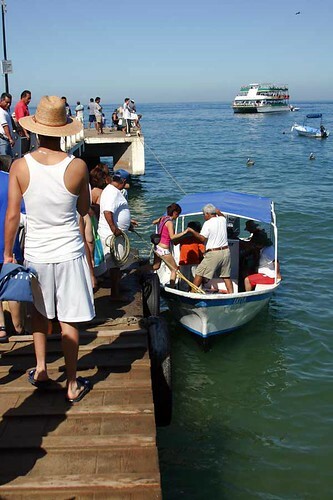 As of today, water taxi schedules change a bit… leaving Yelapa begins at 7:30 am, 8:30, 9:00, and 10:30… all ending in Vallarta. From Los Muertos.. 10:30am, 11am, 11:30, 12:30, 4pm , 4:30pm and 5:30pm. I suggest purchasing tickets from Sergio and Roger at the Lagunita Office, located on the left side, second business…. On Occasion… if its a slow day and the 4pm water taxi is not crowded… the 4:30 taxi will not run, in that case.. sip on a margarita at C and Cy’s and take the 5:30 taxi. This entry was posted on Monday, December 17th, 2007 at 12:03 pm	and is filed under General. You can follow any responses to this entry through the RSS 2.0 feed. You can leave a response, or trackback from your own site.